Looking for site plan software? With RoomSketcher, you can create high-quality 2D and 3D Site Plans that are perfect for real estate, garden design, landscape design, and more. Include measurements, area calculations, and more! 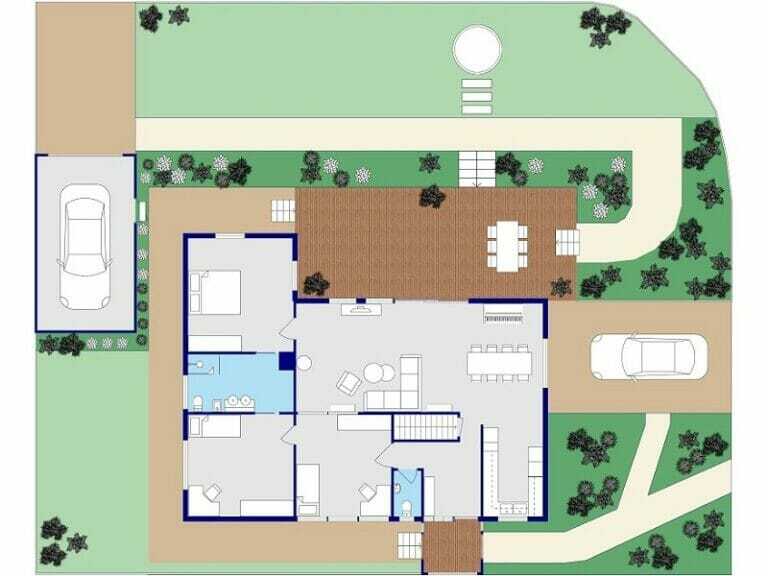 To get started, draw the property layout, add landscaping materials, and then furnish your site plan with plants, trees, outdoor furnishings, and more. It’s that easy! When your layout is complete, add measurements, zone sizes, total area calculations, symbols, and more – whatever you need for your project type. With RoomSketcher, it’s easy to create site plans, property layouts, plot plans, garden designs, backyard layouts, and more. Visualize your site plans in 3D – at the click of a button! View your site plan in 3D as you work using the camera in the app. Just aim the camera, click, and see a 3D view instantly. Then, when your site plan is ready, create beautiful 3D Site Plans, stunning 3D Photos, panoramic 360 Views, and interactive Live 3D walkthroughs to showcase your project. 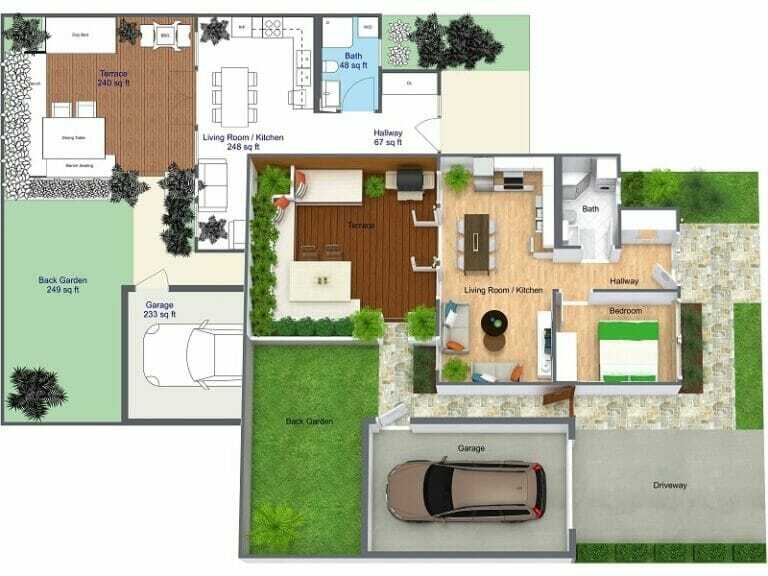 Create professional 2D Site Plans that show a clear overview of your property layout. Include measurements, zone types, area calculations, symbols and more. Work in meters or feet. Print and download to scale, in multiple formats such as JPG, PNG, or PDF. Create beautiful 3D Site Plans – at the click of a button! Show materials, textures, plantings, furnishings, and more. 3D Site Plans are ideal for landscape design because they make it easy for the viewer to visualize how the design will look. Bring your site plans to life with stunning 3D visualizations. Create 3D Photos, panoramic 360 Views, and interactive Live 3D walkthroughs. Show your ideas and showcase outdoor areas and features in stunning 3D. Draw your site plan quickly and easily using the RoomSketcher App on your computer or tablet. 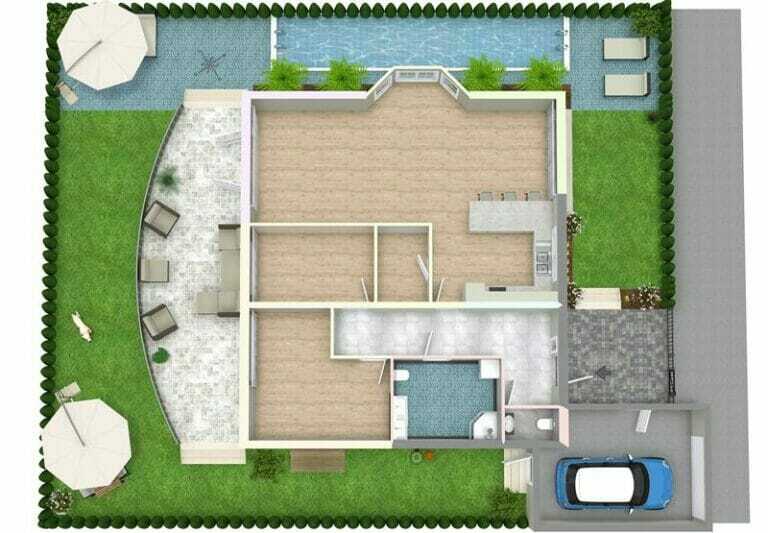 Draw garden layouts, lawns, walkways, driveways, parking areas, terraces and more. Define borders with fences, walls, curbs, and hedges. Customize your site plan with different zone colors, materials, and textures. Add trees, plants, and bushes. Try different landscape materials such as paving, tiles, pebbles, mulch and more to find the right materials for your landscape design. Then add outdoor furnishings such as pools, planters, furniture, and more from the product library. Easily create 3D Photos, 360 Views, and view your design in Live 3D – visualizing your site plan in 3D couldn’t be easier. When your site plan design and layout is complete, create high-quality 2D & 3D Site Plans and 3D visualizations – at the click of a button. 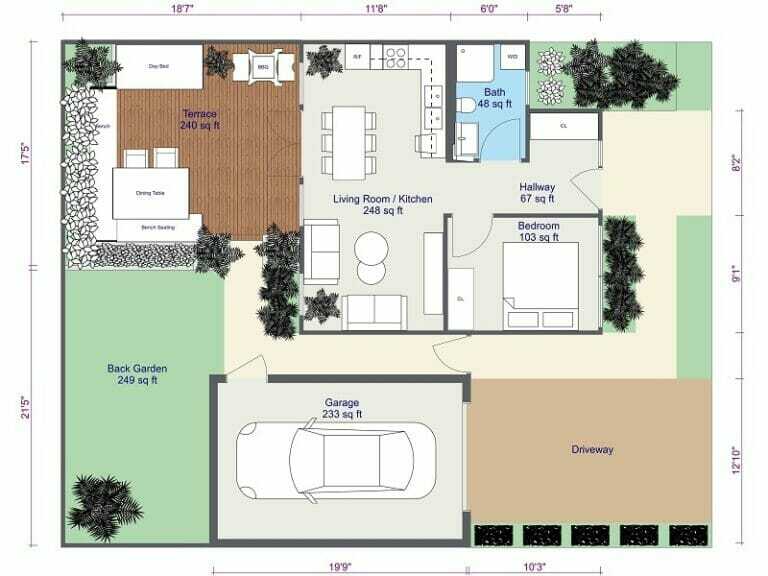 Whether for professional or personal use, RoomSketcher makes it easy to create a site plan. Get started with this easy-to-use site plan software today!